Hard Rock band from Hertford, England (United Kingdom). The band formed in 1968. Along with Led Zeppelin and Black Sabbath, they are considered to be among the pioneers of heavy metal and modern hard rock, although some band members believe that their music cannot be categorised as belonging to any one genre. They were once listed by the Guinness Book of World Records as "the loudest pop group", and have sold over 100 million albums worldwide. Deep Purple were ranked #22 on VH1's Greatest Artists of Hard Rock programme. Deep Purple were inducted into the Rock and Roll Hall of Fame in 2016. Deep Purple is the greatest band of all time, period. 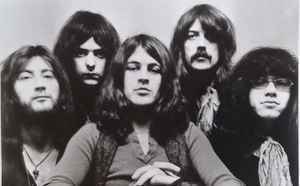 "The loudest band in history"...."Posh Mans Led Zeppelin"....whatever people say deep purple were one of the founders of rock music and one of the greatest bands to have ever lived. No other band has a legacy like Deep Purple, whether you prefer the early and late material with Gillan on vocals or the late 1970s folk rock of David Coverdale, Deep Purple catered for a wide audience. The bands power peaked with the release of Machine Head which contains their biggest hit "Smoke on the water" but others were firm favourites too like Highway Star and Space Truckin. They hit a low in the years to follow with Blackmore and Glover going on to play in Rainbow and Gillan having a break, but like birds to the nest they reformed to produce the stunning "Perfect Strangers" in 1984, my favourite album of the 1980s largely because it was the MKII line up.